If you’ve never seen a chicken dust bathing, the sight can give you quite a shock. Lying in the dirt while vigorously twitching its feet and flopping its wings, the chicken first looks like it’s having an uncontrollable fit. Then it lies perfectly still in the hole it just dug, looking like death itself. Go over to check on the bird and it will jump up and shake itself off, filling the surrounding air with fine dust. It cleans and conditions feathers. Think of dust bathing as the chicken version of dry shampoo. Dust bathing similarly removes excess oil and fluffs up the feathers for maximum protection against sunburn and other injuries. It helps control body temperature. Dust bathing in cool soil or fresh litter can be an important cooling method on hot summer days. Dust bathing in warm, composting deep litter increases warmth in winter. It helps remove external parasites. The preening that follows dust bathing helps a chicken rid its feathers of irritating mites and lice, which are dislodged as the chicken pulls feathers through its beak. It maintains plumage water resistance. During the preening that follows dust bathing, the chicken periodically rubs its beak against the oil gland at the base of its tail and applies the fresh oil to its newly cleaned feathers. The oil both helps the feathers maintain their water resistance and also gives them an attractive gleaming sheen. Chickens with access to dry soil outdoors will create their own dusting bowls. In a coop bedded with deep litter, they will dust bathe indoors during unpleasant weather. To ensure that your chickens have adequate opportunities for dust bathing, provide a bin of dry soil, fine sand, or loose litter both outdoors in the run and inside the coop. The bin might be as simple as a kitty litter box or a sturdy, shallow storage tote. A low roof over an outdoor bin will keep the bathing material dry during wet weather. A bright light over the indoor dusting bin will encourage hens to use it for bathing, rather than as a community nest for egg laying. Many chicken keepers are fond of adding such things such as wood ashes, diatomaceous earth (DE), or sulfur garden powder to their chickens’ dusting bin to control external parasites. Although these materials can effectively discourage external parasites, they can also be harmful to the chickens’ health. Chickens are highly susceptible to respiratory problems, and breathing in any of these additives can make matters worse. If you should wear a dust mask while handling these materials, think how harmful they would be to a chicken, with its faster respiration rate and delicate respiratory system of air sacs. On the other hand, for chickens that are seriously infested with parasites, the benefit of temporarily adding such materials may outweigh the potential danger. Pesticidal sulfur, labeled for treating fruit and vegetable plants, has been used for ages to control mites and lice on chickens. Sulfur occurs naturally in the environment. 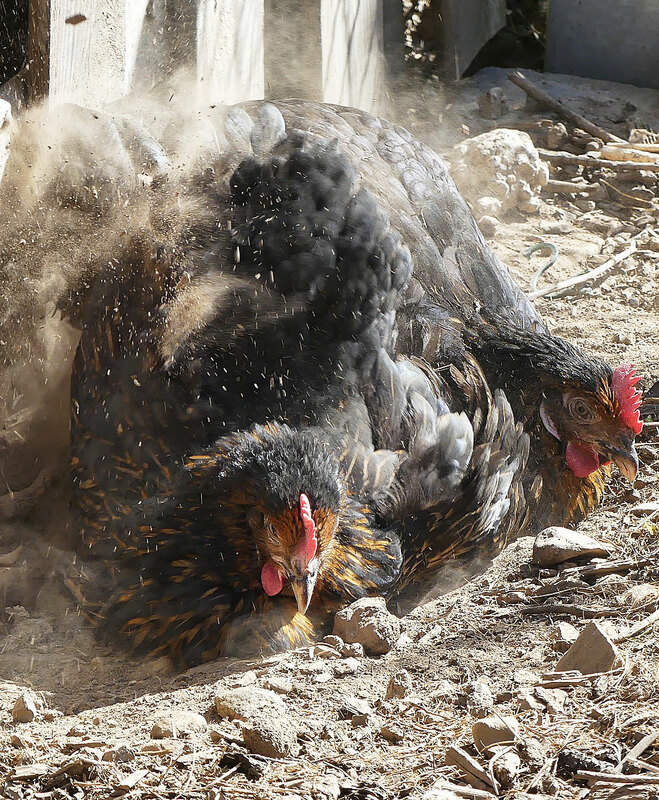 When added to the chickens’ dust bath, it is more effective than diatomaceous earth for two reasons. It has a residual effect, where DE does not. Also unlike DE, the effectiveness of sulfur rubs off onto chickens that don’t themselves bathe in the sulfur-treated dust box. If you wish your chickens to live long and prosper, make sure the dustbin containing sulfur, or any other additive, is in a well-ventilated area — ideally, outdoors, where breezes will whisk away airborne dust. For an indoor dusting bin, ventilate the coop well enough to prevent dust particles from hanging in the air. The act of dust bathing is so important that baby chicks instinctively go through the motions when only a few days old. A broody hen, regardless of how tenaciously she guards her eggs, may take time for a quick dust bath during the few minutes she leaves the nest to grab a snack. Given the opportunity, chickens will invariably hollow out dusting bowls in loose soil, sand, or dry litter. Ensuring your chickens have the opportunity to engage in this essential behavior will help keep them active and healthy. And that’s today’s news from the Cackle Coop. ← How Many Chicken Breeds Are There? Sign-Up for to Receive Updates when Cackle Hatchery posts a new blog! How Many Chicken Breeds Are There? Which Chicken Breeds Make the Best Broody Hens? Sherman on Where Are All the Turkey Eggs? ©2017 Cackle Hatchery. All Rights Reserved.